A hazardous area is defined by the likelihood and concentration of an explosive atmosphere being present in a specific area, and is split into zones depending on the type of atmosphere present. 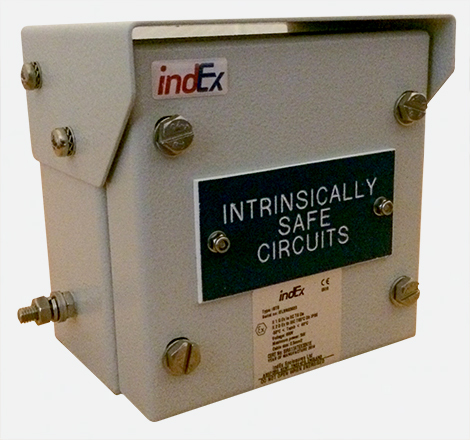 At indEx we have a wealth of knowledge and experience in providing enclosure solutions for hazardous areas. For zone 0 and 20, there is a limited range of products that can be integrated into enclosures, but please speak with our design team for solutions. For zone 1 & 21;- intrinsically safe terminals, with full assembly and certification for zone 1, and protection by enclosure for Zone 21.
indEx enclosures are ideally suited to intrinsically safe zone 0, 1 Field Bus systems. We are able to provide cost effective, robust and durable solutions where the enclosure just needs to house and mount the FB unit. Our indEx engineering and design team has many years of experience in the design and build of zone 1 and 2 pressurized/purged systems, and can adapt our enclosures to suit most px or py solutions. NB. For zone 1, 21, indEx can provide a design and build service. Enclosures can then be tested by third party EN test houses such as SIRA for solutions such as high voltage, field bus systems, control panels and fibre optic control enclosures, at additional cost. ← iSTB complete with blue IS terminals and certified for intrinsically safe circuits. Finish is painted steel with customised rain canopy (can also be used as sun shade - see fabrications) and designed to ensure IP66 is maintained throughout the enclosure but still allowing water runoff.